In January 2006, a 1.1 kilowatt solar electric power system was installed in Maharishi School’s courtyard, funded by a $15,000 Solar 4 R Schools grant from the Bonneville Environmental Foundation (BEF) of Portland, Oregon. The project also implements a renewable energy curriculum “Reading, ‘Riting, ‘Rithmetic and Renewable Energy” for Middle and Upper School students to educate them on the specifics and benefits of solar electric (photovoltaic) power. In a solar exhibit in the School entryway, a computer monitor displays the current electrical output of the system as well as current weather factors (the amount and temperature of solar radiation that determine the amount of energy being produced). This presentation will help students, faculty, and visitors better understand how solar electricity is generated. 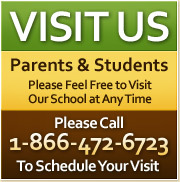 Maharishi School’s web page at the BEF website can be accessed at: http://www.b-e-f.org/renewables/maharishi.shtm. The BEF website will display the amount of electricity being generated by the system and current weather factors. Funding for the Solar 4 R Schools projects is provided by the Vote for Change Renewable Energy Project artists, including Bonnie Raitt, Dave Matthews Band, Pearl Jam, REM, and Stone Gossard (Pearl Jam guitarist). The Bonneville Environmental Foundation manages the projects on behalf of the artists. More information on these projects can be found at: http://www.b-e-f.org/renewables/index.shtm#ss. This solar panel installation in Maharishi School’s courtyard is a first step in reducing the School’s dependence on non-renewable energy. Our goal is to create a larger array of solar panels at the School like the one pictured here. By donating to the solar project, you will significantly increase your donation’s value by saving Maharishi School’s future energy costs. You will also reduce carbon dioxide levels in the atmosphere that come from burning carbon fuels to make electricity. We would be most appreciative and grateful for your donation towards creating this new state-of-the-art energy system for the School. Thank you. Click here to donate online.